Our style is very much "borrowed from the boys." 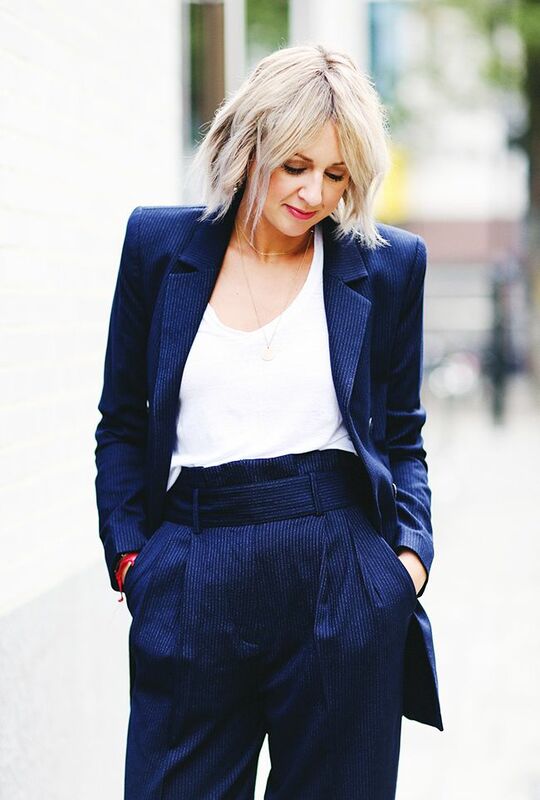 From oversized shirts to mannish blazers, if it has an androgynous edge, we want in. Temporarily looking after a cashmere jumper, button-down or blazer from the menswear department has never been cooler. Whether it's an all-in look or styled with floral dresses, we can't resist our tailored jackets, stompy boots and oversized knits. We love playing with proportions, and lifting from a wardrobe of masculine classics is the perfect way in which to do it. The boundaries of men's and women's fashion are becoming more blurred than ever, so A) it's really easy to pick up the kind of pieces that you want in either department, and B) they've become a really normal part of a hardworking wardrobe. We show you below how to incorporate a fuss-free menswear aesthetic into your style with on-trend "borrowed from the boys" pieces. Keep reading to see the menswear fashion pieces that really work well for all kinds of women too. The pinstripe suit is an effortlessly cool outfit when teamed with trainers—the resulting look is smart enough for meetings with just enough edge. Opt for a relaxed fit to avoid looking too '80s. An essential part of your capsule wardrobe. This particular shirt is a simple but stylish classic (the more oversized, the better). Wear over a lace bra to add a touch of flirtatiousness, and team it with denim and heels. Don't think that tuxedos are strictly for black-tie events only. I love teaming my Blazé Milano jacket (the blazer brand is the very best) with jeans to play on the smart/casual dress code I always favour. Wear slightly oversized so it hangs just right. Wrap yourself up in cashmere or wool for cosy comfort dressing. This is an item you can steal directly from the men in your life, or head to the men's sections at Uniqlo, Zara or M&S for the more relaxed fit this trend requires. Team with Chelsea boots—this season's greatest ankle boot style. The jacket of the season, checked blazers are everywhere right now. The perfect throw-on-over-everything piece. You might find that these heritage checks make you think of something your granddad wore, but it couldn't be more on trend—trust us. One of my favourite pieces for winter. Nothing says classic cool quite like a camel coat. This one is an old-season style from The Kooples, but I'm on the lookout for a longer-line silhouette (the longer the better when it comes to outerwear for autumn/winter 2017). Keep up the look by pairing with tailored trousers and loafers. See more of Lou and Em's top trends and shopping picks on their website, A Style Album.